I was doing a little housekeeping (gasp!) 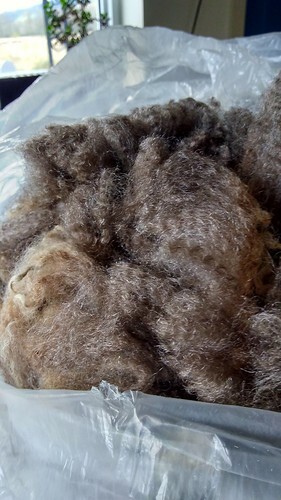 up in the wool room yesterday, and came across a bag of fleece that I’d forgotten I had. Yep. 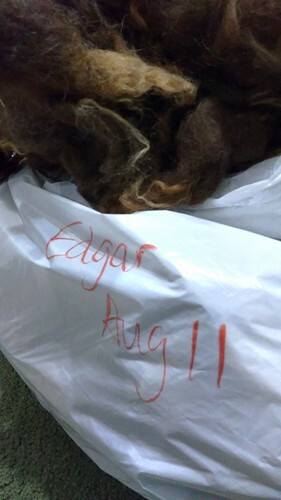 That’s fall fleece from a yearling Edgar. And look at the color! I’d almost forgotten how dark his fleece was when he was a young-un. Amazing how he’s faded out over the last 5 years, isn’t it? 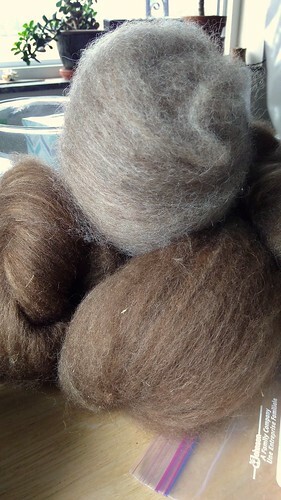 I just figured that it was normal aging, and kind of like how the lighter color looks overdyed, so didn’t think a lot about it. This is Edgar fleece this fall. It looks like he’s regaining some of that lost color. Not reddish-brown like he was as a baby, but definitely brown. I’m wondering if it might be a result of changing the mineral that I’m giving them, as I started that in probably February-March.